clairebonf, knottie5037f7c62c17c10b, Jennie523, mrsbarronsbaby, knottiedb9cae5e75a43346 and 135 others joined. slbinetti earned the Second Anniversary badge. knottief3e59eb84ff33b72, mredwing, knottie9504b87360d4d576, knottiea8a8ebbd74f3119d, mindyb9813 and 114 others were promoted to member. knottiea8a8ebbd74f3119d, knottiea37171cd8fd688d6, bonnierae___, knottief6043ddfafed9b49, knottiea16db1d405d58b99 and 21 others earned the Photogenic badge. Borrowed this idea from some of the other BMBs. Everyone should be able to access the spreadsheet through google docs and add your information. If you are unable to access the spreadsheet, post your info below and I can update for you. Also, you can leave out any information that you do not feel comfortable sharing (location or other children). @JLaVO888 Thanks for getting this started! @navete Are you able to edit it? I need a test subject to make sure I set it up correctly. @JLaVO888 I’m having trouble editing on mobile. Prompts me to use the Sheets app but then nothing happens when I click “Get the App” (SS in spoiler). Will try on my laptop and let you know. @navete Same thing happened to me on Mobile. Worked fine when I was on my laptop though. @JLaVO888 OK, I was able to easily make edits from my computer. Would you add to the instructions that users need to sign out of their personal Google accounts before writing, if they want to remain anonymous? I can take SS from my phone to show how to do that. Is my info shown? I didn't think about that. @JLaVO888 Just shows your screen name (JLa V0888) but it does link to your Google + page. Doesn't show any personal info except for your profile photo. ETA: SS of where to log out of Google account before editing. If you've logged out, it'll say "Sign In" as shown in the spoiler below. You can continue to edit as an anonymous user. @navete Thanks! I logged out and then made some changes and now it shows edits made by anonymous. Do you think the directions I added are clear enough? @JLaVO888 Perfect; I think that's pretty clear! @BumpAdmin A sticky would be wonderful! Thank you for organizing this! just updated my info! 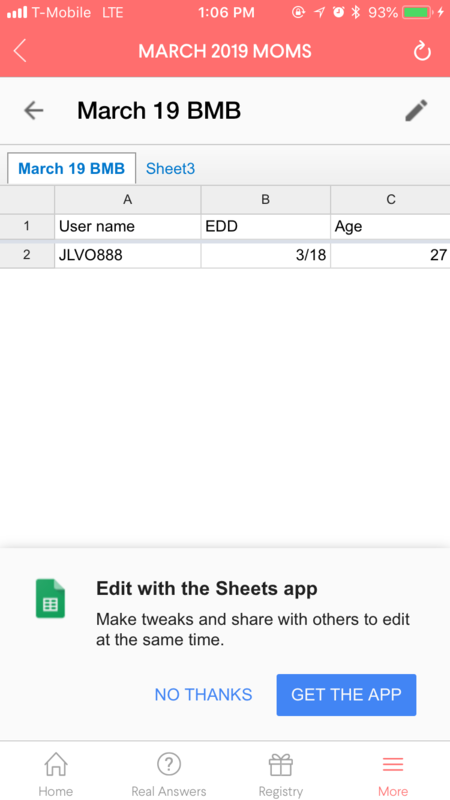 Hi can you please add me to the sheet? Team Blue/Pink/Green (can update as we know): team green! Baby #1 BFP 6/10/2011-EDD 2/19/2012-DS Born 2/10/2012! Baby #2 BFP 1/3/2014-EDD 9/12/2014 -DD Born 9/10/2014! Baby #3 BFP 7/8/2018-EDD 3/17/2019-Team Green! Can you add for me please? Can't get it to work on my phone. Can you add me too? From mobile it tends to not want to work but I got everyone added. If there is anyone else having problems, I don't mind at all adding for you as well. Can you please add me, too?? EDD: 3/11 on fertility friend (ovulation based) or 3/6 on p tracker (LMP based) - I'll update you after my first US! This is our first baby! Team finding out - as my mom says, it will be a surprise either way at this point! I'd love to be added as well! Thank you for adding those of us on mobile!! Quick question, what is the purpose of this spreadsheet? I'm very new here and new to all of this pregnancy business. If someone could explain I would greatly appreciate it. Thank you!! Thank you for your help with mobile! @valentynsi It makes it easier to keep everyone organized in your mind as we get to know each other. Then as due dates approach it’s really nice to see who is due and who has had their baby without having to keep asking that person all the time. The boards can get really filled up so it just makes it easier to keep track of who is who and who is having what when. No worries! I can easily sort the list with the click of one button! So I’m on mobile and thought I’d have made it to my computer by now to update clearly that’s not happening ... can you add me please. Finding out the gender eventually. 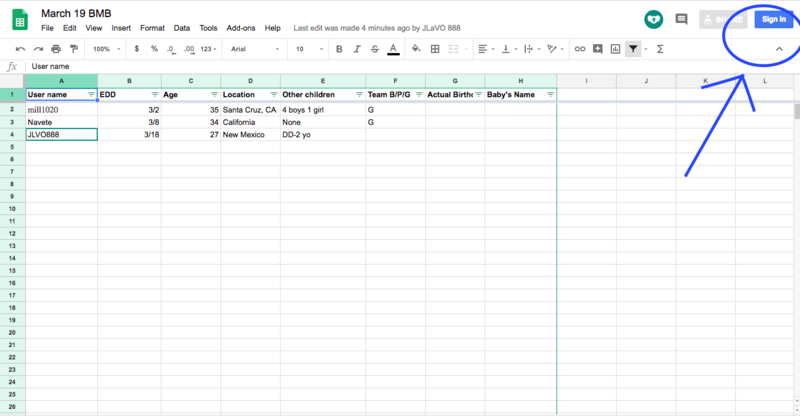 @alalauren15 @cdiddy81 Something happened to your due dates on the spreadsheet. Can you please add me? I'm having issues trying to update. Team Blue/Pink/Green (can update as we know) - Guess we'll find out! Hi! Would you please add me to the list?